As the classic Christmas song goes, “it’s the most wonderful time of the year!” A time to spend with family, friends and loved ones, cozying up around the fireplace or gathering around the dining room table. However, from pumpkin pie to Christmas cookies, the holidays are also a time when many indulge in sweet treats that can contribute to tooth decay. Developing a cavity certainly won’t boost your holiday spirit, so it’s especially important to maintain your oral health during all the festivities. Fortunately, a dentist in Long Island City is here to help with 3 tips to maintain a happy, healthy smile this holiday season. The holidays are a sugary gauntlet that every person must navigate carefully – not only to preserve their waistline, but also to protect their teeth! Sweet holiday treats like candy corn, pumpkin pie, sugar cookies, eggnog, and more can easily lead to tooth decay. 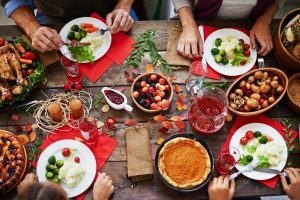 Thanksgiving and Christmas are some of the biggest travel weeks of the year as families cross state lines to celebrate the holidays with their relatives and loved ones. Traveling during the holidays can be hectic and easily disrupt one’s oral hygiene routine. Before packing – make a list that includes everything you need to keep your teeth clean: your toothbrush, toothpaste and floss. When packing – store these items first so you do not forget them. People often leave behind their toothbrush because they intend on packing it right before they depart after one last brush. Have a backup plan – Consider buying a second travel toothbrush and small toothpaste to keep in your suitcase at all times. Give yourself the gift of a healthy smile! Start the new year off right by following these 3 oral health tips for the holiday season. A proud graduate of the Boston University Goldman School of Dental Medicine, Dr. Ishwinder Saran has extensive training and experience in all types of general dentistry. He is happy to speak with patients about strategies and practices to achieve healthy, confident smiles all year round. For more oral health tips, visit the LIC Dental Associates website or call Dr. Saran at the office at 718-530-6539.